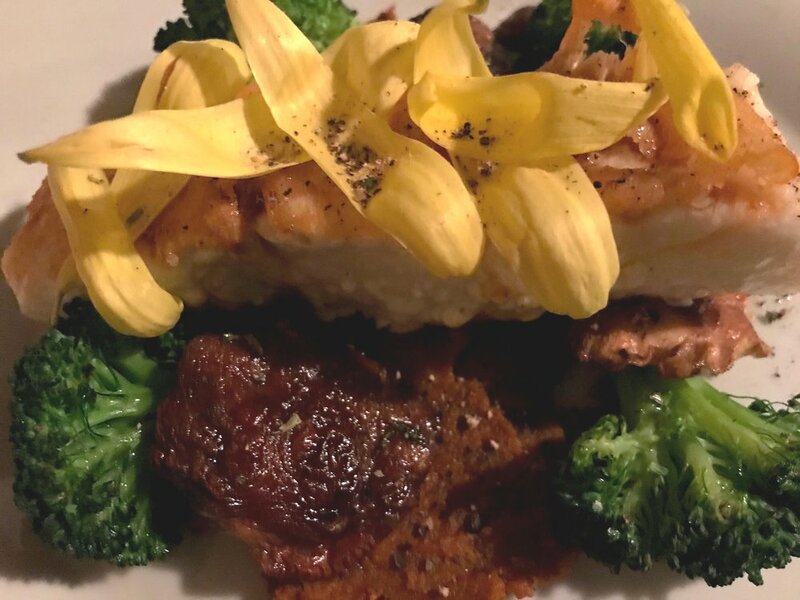 The romantic COHO Restaurant, located in a cute Craftsman-style house in the heart of Friday Harbor, with nine intimate tables in what once was a living room, offers the essence of Farm-to-Table dining. San Juan Island’s lush farmland and pristine waters produce an abundance of fresh, delicious fare, unique to the isle and region. Produce harvested just hours before you eat it, has more enzymes and vitamins – it’s alive! Eating local and in season also reduces your carbon footprint and thereby helps the wildlife you have come to enjoy. But really, it’s just plain delicious. And beautiful. Chef Ryan’s creations, decorated with edible flowers, curious spices and luscious sauces are gorgeous works of art. Everything here is made from scratch, including the stocks for soups, baked goods, pasta and ice cream. In addition to sourcing from local vendors, COHO Restaurant kicked the Farm-to-Table concept up a notch by organizing a Table-to-Farm composting program with the local Sweet Earth Farm. To make your culinary San Juan Island journey complete, the COHO Restaurant offers spirits and cocktails from San Juan Distillery, as well as local Madrone cider. Each wine on their impressive, local, national and international, 200 +, wine list is selected from small producers, making handcrafted, authentic regional wines. My husband and I ducked into the COHO Restaurant right at 5:00pm, when they opened, on a drizzly, off-season day. Immediately enveloped in warmth and good smells, we were greeted by Emily, our friendly and knowledgeable server. At the cozy window table for two, Emily expertly presented us with our options. COHO offers a daily First Seating from 5:00pm to 5:45PM, a 3-course tasting menu for two, plus a bottle of wine for $70. If you prefer to order a main course from the current menu instead of the First Seating options, you may do so for a nominal surcharge. What a deal! With Emily’s help we picked a red wine from the year we got married and without further ado we were presented with wild mushroom and wild rice soup and local, spicy greens. Their flavor combined with the fresh lime vinaigrette energized us immediately. The soup was delicious as well. I make my own stock and can taste a real soup a mile away. Ryan’s stock passed my litmus test. For the main course, I chose the house-made Pappardelle with Lamb Bolognese from the First Seating menu, while my hubbie went for the special of the day: fresh, local Halibut with carrot puree, shitake mushrooms and broccoli for only a $6 surcharge. The fish was cooked to perfection with the carrot puree enhancing its flavor in a miraculous way. My pasta dish was very gratifying. Every bite revealed different textures and flavors of pasta, lamb, sauce, greens and ricotta. My husband and I are usually not dessert people. Boy, were we glad our menu included it. The house-made chocolate truffle & pear vanilla ice cream was exquisite. The latter contained candied ginger and together they may have been the best ice cream concoction I have ever tasted. Not too sweet, rich, yet delicate. In addition to being open year-round and on holidays, COHO Restaurant presents Special Event Dinners throughout the year, featuring local wine makers and brew masters, as well as special event and off-site catering. Older PostGo Where You Feel Most Alive!